I'm sure we all go through times when we don't feel like going an extra mile getting all prettied up. Wearing heels doesn't sound like an attractive idea at the moment and close-fitting clothes is completely out of the question. That was exactly the kind of situation that I was going through previous to this photoshoot (I blame my hormones). I had a lunch to attend and run a few errands with my husband and I knew I had to come up with something decent to wear to face the world and what do you know, my Nikon as well. That morning was a good opportunity to put my mind to work toward my outfit (I'm a spontaneous dresser, so this is not typical). Soon enough the inevitable question popped up in my head: "Is there anything that I can wear that is comfortable, that I love and can be stylish as well?" Right away "mixing" was the word that came to my mind. But mixing what? In my case and, as I mentioned several times before, creating a juxtaposed look is what I really love, therefore it couldn't take too much of my effort to make it happen. Blazer: Ralph Lauren. Similar/Blouse: Helene Berman. Similar/Jeans: J. Brand. 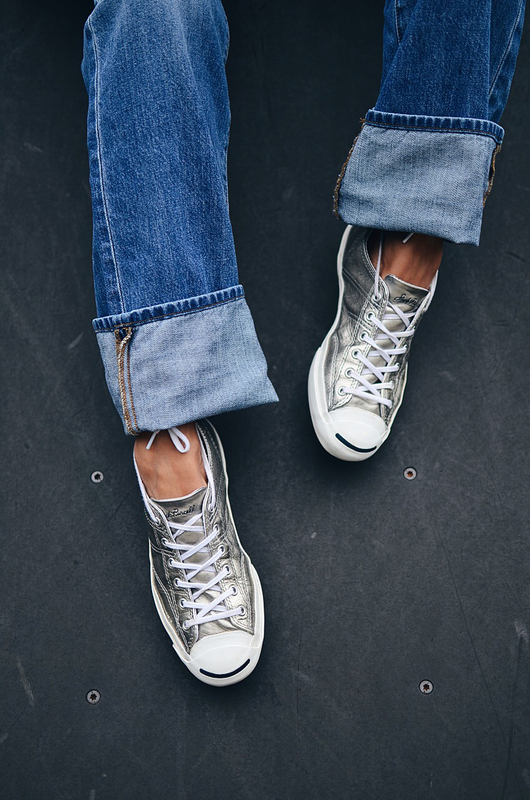 Similar/Sneakers: Jack Purcel-Converse. Similar/Bag: Valentino. Similar/Chandeliers: Givenchy. Similar/Sunglasses: Kate Spade. Similar. 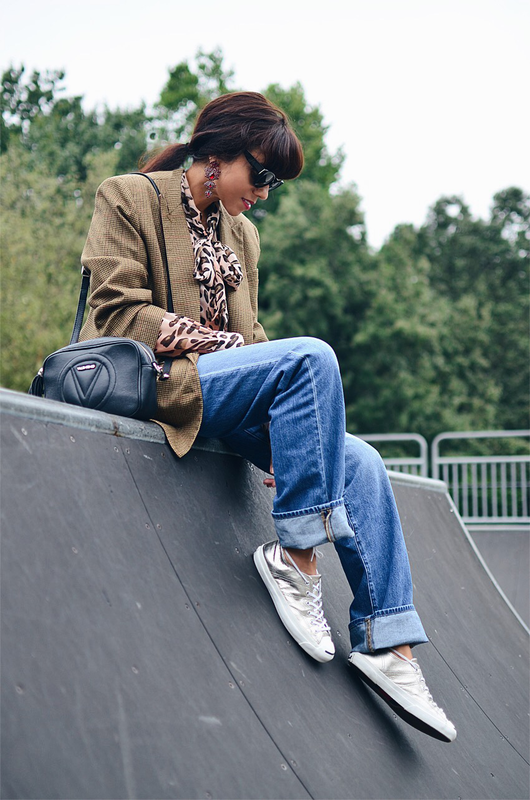 As you can see, I wore a houndstooth oversized blazer with my boyfriend jeans and silver kicks (loving the metallic trend), which besides being boyish-esque, they meant major comfort to me. I could have worn a t-shirt, but since my day was not going to be extremely casual and I also needed a feminine touch, I opted to wear a leopard print bow blouse and chandelier earrings. All these pieces were within my comfort zone and yet, I managed to feel stylish. I really felt pretty good about what I had created under my hormonal circumstances; so good, in fact, I even accepted my husband's idea of taking pictures at a skate park. Love chic and stylish animal print blouse! Metallic accents are my favs- they give an outfit a fab youthful but sophisticated flavor. Super! Thanks, Katie!! It was very nice talking to you yesterday. Gracias, preciosa. Que tengas un buen fin de semana. Happy, Joyous, Flirty and Fun.